These delicious Instant Pot chicken breast recipes are the solution to weeknight dinner stress. SEVEN flavors so you will never get bored with dinner, and each one comes with a sauce that is perfect for spooning over rice and veggies. 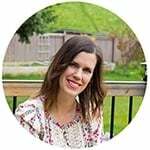 Instant Pot addicts, I think you’re going to like this post. 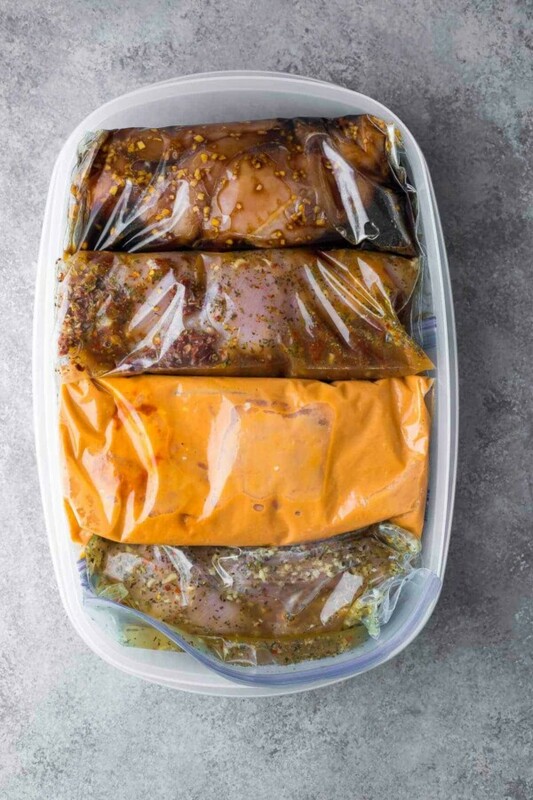 I am constantly asked if you can cook the chicken marinades from the 7 Chicken Marinade Recipes You Can Freeze post in the Instant Pot, and sadly the answer is no…because they don’t have enough liquid. I’ve been working on this post for months as the answer to this issue…and I’m so happy to share these 7 Instant Pot Chicken Breast Recipes with you today! Since really getting to know my Instant Pot, boneless skinless chicken breasts have become one of my favorite things to cook in it. 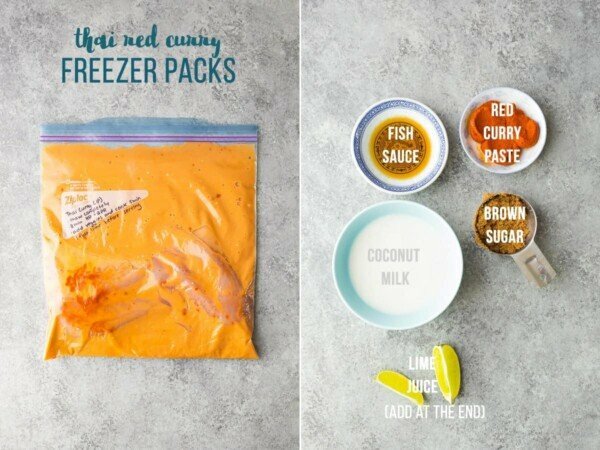 they also make for easy freezer packs! 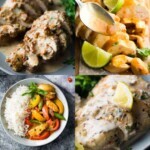 How to prep these Instant Pot chicken breast recipes as freezer packs? Don’t forget to pin this post to save the recipes for later! Can I cook these Instant Pot chicken breast recipes from frozen? Maybe, but I haven’t tested this, and there may be issues with the ingredients burning. I recommend completely thawing the freezer packs before cooking. Can I add more chicken breasts? Yes! These recipes have only been tested with 2 large chicken breasts (roughly 1 lb), but adding should work fine. You may want to double the sauce as well. It will take longer for the Instant Pot to come to pressure but should cook with roughly the same cook time. How long do I cook them? I use 8 min high pressure and a quick pressure release for 7 oz chicken breasts. Any larger, you may want to add in an extra 1-2 minutes. Any smaller and you’ll want to reduce the cook time by 1-2 minutes. Can I use chicken thighs? 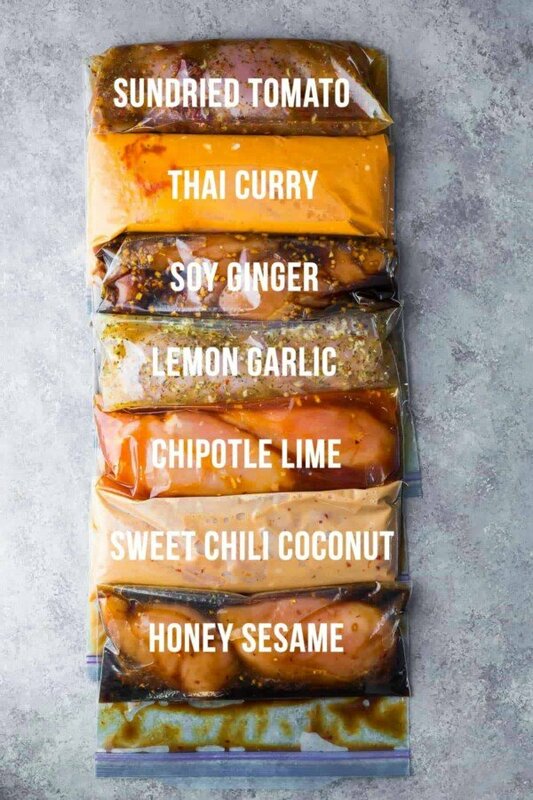 Yes, boneless skinless chicken thighs would be great in these marinades. Adjust the cook time to 10 minutes. Can I use these recipes without freezing them? Yes, absolutely. Pop them in the fridge for 2 hours all the way up to 24 hours. I don’t recommend marinating longer than that without freezing. Can I cook these recipes in the slow cooker? Maybe, although they haven’t been tested. Check out this post with 7 Slow Cooker Chicken Recipes if you’re looking for slow cooker recipes! GRAB THE PRINTABLE CREAMY LEMON GARLIC INSTANT POT CHICKEN BREASTS RECIPE HERE! We never prep our chicken with cream based sauces because they take so dang long to prep. These creamy lemon garlic Instant Pot chicken breasts are SO easy! After cooking your chicken in some stock with spices and garlic, you will remove the chicken breasts and select ‘sautee’ to reduce the sauce down for 7-10 minutes. Stir in the parmesan cheese, cream and lemon juice and you are getting a velvety smooth sauce that packs a serious punch of flavor! GRAB THE PRINTABLE INSTANT POT CHICKEN BREASTS WITH SUN DRIED TOMATO SAUCE RECIPE HERE! Another creamy sauce recipe, this one with sun dried tomatoes. Same concept as the creamy lemon garlic chicken recipe: cook the chicken, remove to rest while you reduce the sauce for 7-10 minutes. Stir in the parmesan cheese and cream and you are getting one seriously delicious creamy roasted red pepper sauce! GRAB THE PRINTABLE INSTANT POT THAI CURRY CHICKEN RECIPE HERE! WARNING: spicy!! But also: delicious! This is such a great ‘stir fry’ base. Cook your chicken in the coconut milk, curry paste, fish sauce and brown sugar. After cooking, remove the chicken and add in a ton of veggies. Cook for 3-5 minutes, until softened, then add some lime juice. Serve over rice! Easiest weeknight curry ever. GET THE PRINTABLE INSTANT POT SWEET CHILI COCONUT STIR FRY RECIPE HERE! This is adapted from one of the popular stir fry sauce recipes in this post of 7 Easy Stir Fry Sauce Recipes. After cooking the chicken, remove from the Instant Pot and add any veggies you’d like to ‘stir fry’ in this sauce. Serve over rice. 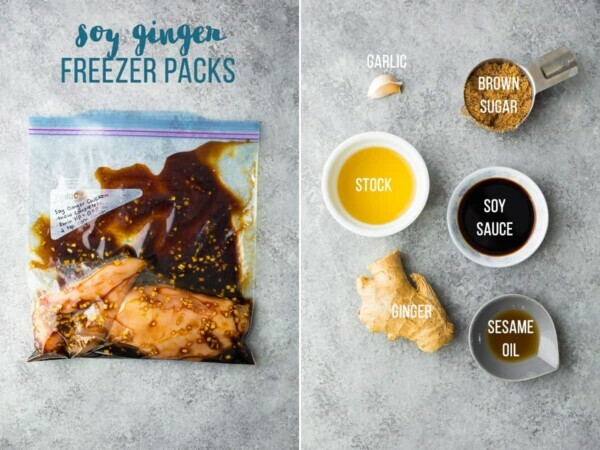 GRAB THE PRINTABLE INSTANT POT SOY GINGER CHICKEN RECIPE HERE! 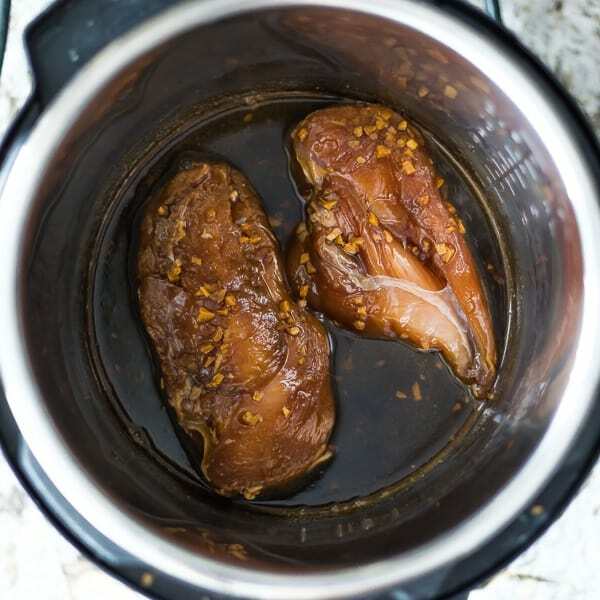 Same recipe as this Soy Ginger Instant Pot Pork Tenderloin, and it works great on chicken too! Cook the chicken in the soy ginger sauce, remove from the pan and stir in some cornstarch to thicken over ‘sautee’. GRAB THE PRINTABLE INSTANT POT HONEY SESAME CHICKEN RECIPE HERE! Last but not least is the Instant Pot honey sesame chicken recipe that you may have already seen on my site. It is simple, quick to cook, and is perfect served with side veggies, or by adding the veggies in as a ‘stir fry’. GRAB THE PRINTABLE INSTANT POT CHIPOTLE LIME CHICKEN RECIPE HERE! This sauce is adapted from this Slow Cooker Chipotle Honey Chicken Taco Salad recipe, and is the perfect blend of sweet, savory, smoky and tangy. Similar to the soy ginger chicken, after cooking, you will remove the chicken breast and stir in some cornstarch to thicken the sauce using the sautee function of the Instant Pot. We LOVED this recipe served in tacos, but this chicken would be great served over rice, or on a salad. 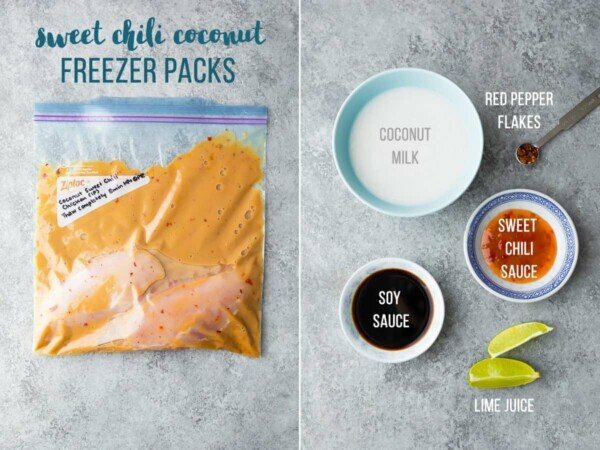 These delicious Instant Pot chicken breast freezer packs are the solution to weeknight dinners. Assemble the ingredients ahead and freeze until you are ready to cook up! SEVEN flavors so you will never get bored with dinner, and each one comes with a sauce that is perfect for spooning over rice and veggies. 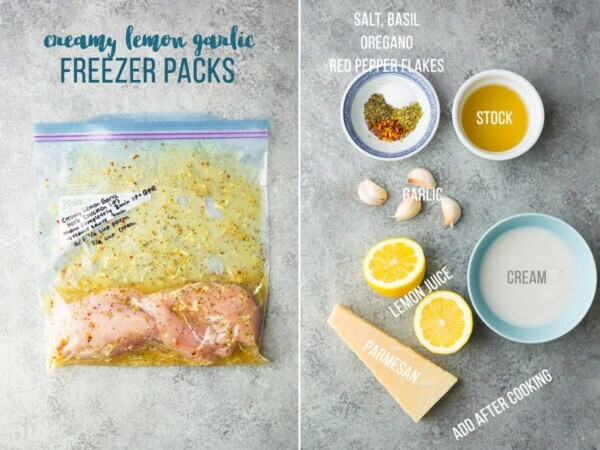 find the printable Creamy Lemon Garlic Chicken recipe here! find the printable Instant Pot Chicken Breasts with Sun Dried Tomato Cream Sauce recipe here! find the printable Instant Pot Thai Curry Chicken recipe here! find the printable Instant Pot Coconut Sweet Chili Stir Fry Recipe here! 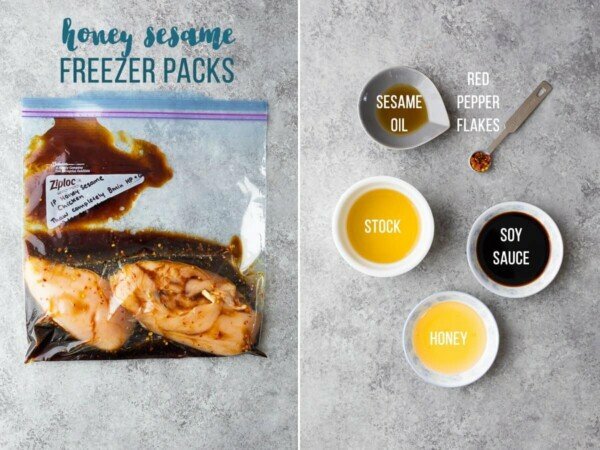 find the printable Honey Sesame Chicken recipe here! get the printable chipotle lime chicken recipe here! Combine all ingredients in a 6 quart Instant Pot (unless listed as 'after reducing sauce'. Cook on high pressure for 8 minutes (for average 7 oz chicken breasts; see note). Release the pressure when the Instant Pot beeps (quick pressure release). Using a pair of tongs, carefully remove the chicken from the Instant Pot and allow to rest while you reduce the sauce. Reduce the sauce: select 'sautee' on the Instant Pot, and simmer, stirring occasionally, for 7-10 minutes. When roughly 1/3 of a cup of the sauce remains (and you start to see the bottom of the IP as you stir), stir in the parmesan cheese, cream, and lemon (for the lemon garlic chicken only). Stir until cheese is melted and sauce is heated through (but not boiling), and remove the pot from the Instant Pot base using oven mitts. Spoon the sauce over chicken breast, rice and veggies. Combine all ingredients in 6 quart Instant Pot (unless listed as 'after cooking'). Using a pair of tongs, carefully remove the chicken from the Instant Pot and allow to rest while you cook the veggies. Add quick cooking veggies such as thinly sliced bell peppers, bok choy, and snap peas to the Instant Pot and select 'sautee'. Cook, stirring frequently, for 3-5 minutes, until veggies are tender. Slice chicken and return to the pot. Stir in the lime juice (Thai Curry only). Serve over rice, spooning the sauce over everything. Using a pair of tongs, carefully remove the chicken from the Instant Pot and allow to rest while you thicken the sauce (you can also add some veggies in at this point and cook for 3-5 minutes before adding the cornstarch). Mix the cornstarch with 2 tablespoons of water, then add the slurry into the Instant Pot. Select 'sautee', and simmer for 1-2 minutes, until sauce is thickened to your liking. Serve over rice (soy ginger and honey chipotle), or in tacos (chipotle lime). *The cook time of 8 minutes works perfectly for average sized 7 oz chicken breasts. For smaller portions, reduce the cook time 1-2 minutes, and for larger portions, increase the cook time by 1-2 minutes. I tried a few of your recipes and the chicken comes out dry and bland. Has anyone else experienced this and any recommendations for improvement? Thanks! Sorry to hear that, Tiffany. Your chicken breasts should absolutely not be dry, and that leads me to think that they may have been smaller than 7 oz. Do you know the approx size? As for blandness, I am also surprised. Can you tell me which recipes you found bland? So many great ideas. Can’t wait to try some. I used to hate cooking but only because I thought you should spend tons of time there. Instant pot made my life easier and now I can enjoy delicious meals all made by me!! Hi Nikky! I hope you enjoy! Incredible recipes! Saved a few to meal prep for next week! Thanks for sharing! Thank you so much! Hope you enjoy some of them! This idea is brilliant! I love the variety, plus the fact that you give serving suggestions for each. Makes dinner easy and delicious! Can I make these meals in a crockpot instead of IP? I was reading the manual to my instant pot and it says I need at least 1litre of liquid for it to come to pressure . Would it still be okay to use your recipes or would I have to make some adjustments? Hello, and thank you! Do you have a shopping list of ingredients for all of these receipes? Thank you for the recipes. How long do they last in the fridge? Do I need to freeze or can I keep them in the fridge for a couple of days? Hi Flo! I don’t recommend marinating chicken for more than 24 hours. I would freeze if you need to leave it any longer than that. After taking my chicken out there was some grisle or fat in the pot. Do you remove that? Chicken came out perfect! Adding some mushrooms and calabrian peppers for spice. Hi Stacey, my chicken breasts have all been pretty lean. If there’s some fat on them to start, I might cut it off to prevent it from getting in the sauce. Which recipe were you using? I’m slightly confused, so I want to be sure before I attempt any of these. 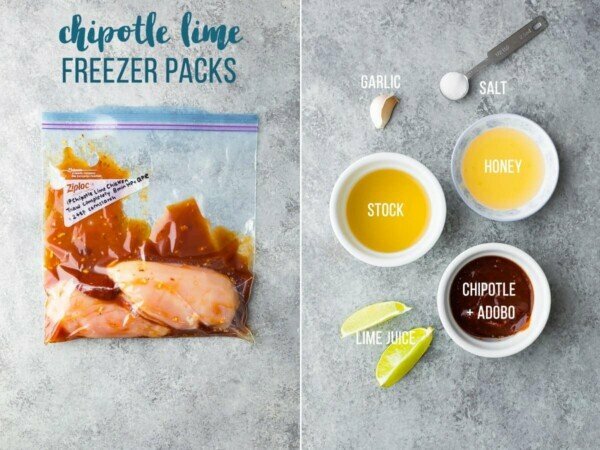 Are the photos on the right all the ingredients that go into each bag with the chicken, and then ALL of the contents of the freezer bag (chicken and marinade both) all go into the pot at the same time without having to add anything additional at the time of preparing it?? Hi Jenn! The photos show all the ingredients regardless of when they go in. Focus on the recipe card, which specifically lists which ingredients go in the bags and which ingredients are added after cooking. I am going through and adding a full post for each finished product, which may be easier to follow. We already have 3 of the recipes linked and another going up on Monday 🙂 Hope you enjoy! I was wondering that too. haha I just got my ip and havnt even done the water test yet. Hi. Do you know how long I would cook these if I want to double the recipe? Hi Amber! I haven’t tried with 2 lbs of chicken, but it should cook for the same amount of time. If there isn’t as much space for the steam around the chicken it might take a touch longer. I’d check after 8 min and if it’s not done I’d put it back for 1-2 more. 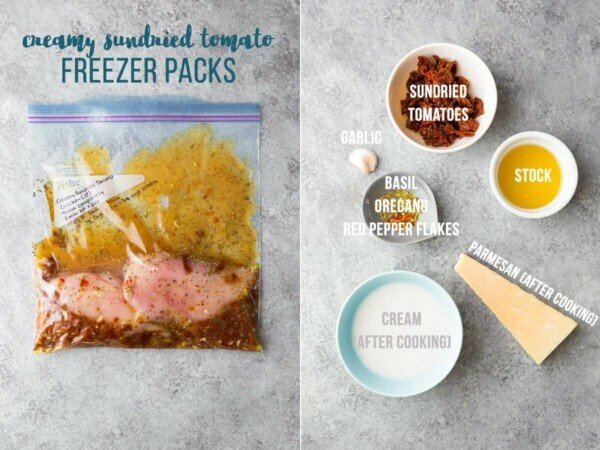 Your recipes are amazing and as a veggie it’s pretty easy to adapt but as a suggestion..rather than using plastic bags perhaps you could consider using the reusable silicon freezer pockets available from stores like Amazon? I know initially they’re not cheap but you will save long term, they are fantastic and they will help with the world’s waste plastic problem ? Thank you so much for the suggestion! I have been on the look-out for a good alternative to freezer bags. Are they dishwasher safe? There’s not many times I’ve come across a group of recipes where I like them all. This is the first! Every single one of them I would like….some I know I would LOVE! Going to pin and next time we get some breasts will do them. Thank you! Yay! Day made. Thank you, Michelle! I can’t wait to try these out — I’m all about my Instant Pot these days, and I love the convenience of having dinner mostly ready in the freezer. Hi can I make these in the 3qt instant pot? I just got one and haven’t used it yet! Hi Paola, unfortunately I have no experience with the 3 quart instant pot so I can’t say for sure. Hi ! Thanks you for these receipes which look soooo tasty ! I would like to know if you add water to the chicken + marinade in the instant pot ? If yes, 250ml ? Hi Guillaume! No need to add water to the Instant Pot for these recipes, as the sauce is already 1 cup (or close to 1 cup) for each of these recipes and is enough liquid for the pot to come to pressure. I have tried all of these recipes and they are great, perfect for those rushed dinner times. How much stock do you use in the creamy sundried tomato sauce recipe? It’s like you were reading my mind. I was just bored with my chicken two nights ago. And I have only just started playing with my Instant Pot. I have only made a few things in it and I haven’t gotten into chicken yet. These look delicious! I know what I’ll be doing with my weekend – preparing chicken! thank you! How long do these take to thaw in the fridge after freezing? Is overnight good or should I plan further ahead? Hi Conor! I would think they’d be thawed after 24 hours in the fridge…I normally give them a bit of a head start on the counter for a few hours then pop them in the fridge to thaw overnight. I LOVE THESE RECIPES BUT I DO NOT OWN AN ISTANT POT. CAN I JUST COOK THESE IN THE OVER OR ON THE STOVE? IM ASSUMING SO. LOL PLEASE LET ME KNOW! THANKS! Oh gosh, I wanna fill my instant pot with each and every one of these gorgeous chicken recipes, Denise! They all look SO amazing, especially that chipotle lime one!